How parents and coaches are grappling with the escalating fears of concussion risks. “It’s a battle you can’t fight,” says Ellis, “because I can’t stand there and say we can prevent it.” He saw 10 percent of his players diagnosed with concussions last season. The worry is becoming widespread. From Bob Costas to Barack Obama, prominent football fans are admitting that rising awareness of concussion risks would prevent them from allowing a son to put on shoulder pads. From 2010 to 2012, participation in Pop Warner youth football declined by 9.5 percent. In a recent Wall Street Journal/NBC poll, 40 percent of respondents said they would not let a child play football. Those fears are fueled largely by headlines about the links between sports-related concussions and chronic traumatic encephalopathy (CTE), a degenerative neurological disease. In January, a federal judge threw out a $765 million settlement between the NFL and its players union due to fears the settlement isn’t large enough to cover all the afflicted players. Against this backdrop, “we need to have a good conversation about whether it’s appropriate to put children into voluntary activities where they’ll take hundreds of blows to the head,” says Chris Nowinski, a former Harvard football player and professional wrestler who now heads the Sports Legacy Institute and co-directs the Boston University center that’s driving the CTE research agenda. These conversations are playing out in my home, too. My two sons, 13 and 9, want to go out for football. My older son, Jack, went out for our community team in 2010 but was sidelined by an off-the-field concussion (a playground accident) that affected his schoolwork and kept him out of sports for two months. As a result, my wife and I have been reluctant to let him return to football — or to allow our younger son, Tommy, to begin playing. To explore how one community is dealing with this issue, I talked with coaches, league officials, and parents — many of them our friends — in Westborough, where we live. As I searched for the right answer for our family, I discovered conflicting advice, rising anxiety — and a legitimate parenting quandary. FEWER KIDS ARE signing up for football for a number of reasons, such as the demands of academics, the popularity of global sports like soccer (particularly among immigrant populations), and extracurricular activity fees. Yet no coach disputes that concussions have become a primary parental concern. Until a few years ago, “getting your bell rung” was no big deal, and the medical advice was to let a player reenter a game as soon as he felt better. That ethos began changing as doctors became more aware of “second impact syndrome,” in which a player who’s suffered a concussion can risk catastrophic injury if he sustains another head injury before the first one has completely healed. By the late 1990s, studies revealed that players’ cognitive function could take weeks to be restored after a head injury and that dangers could persist even after that restoration, causing doctors over time to become much more cautious in treating sports concussions. This awareness has transformed how football is coached and played. Coaches at all levels now undergo training to recognize concussion symptoms (which include dizziness, headache, and confusion). Teams require signed doctor’s notes before sidelined kids can return to play. Coaches spend more time teaching correct tackling technique. 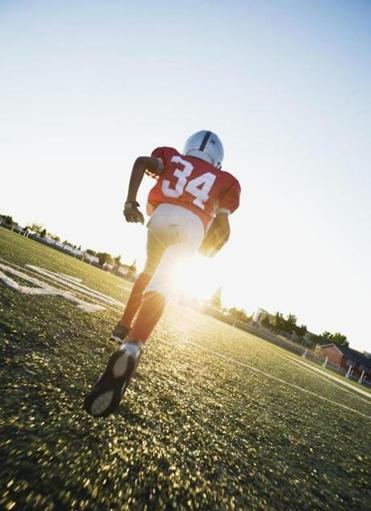 In 2012, new Pop Warner rules mandated that no more than one-third of practice time could be spent in live contact and outlawed head-on tackling drills in which players start out more than 3 yards apart, to limit the velocity of hits. Many youth football programs have also upgraded helmets, though medical professionals express doubt that pricier equipment really reduces concussion risk. Others believe the hyper-vigilance is necessary. Quarterback Earl Jenkins set a school passing record our senior year, but he also took some nasty hits — including a helmet-to-helmet collision that left him unconscious. Jenkins, a school administrator and high school football coach, has had MRIs to try to diagnose his frequent headaches. (He’s not sure if they’re related to football or to the car accident he suffered at age 20.) None of this convinces him to keep his 12-year-old son, Jared, out of the game, but when Jenkins coaches, he takes extra steps — he even requires helmets for flag-football games — to limit risks. 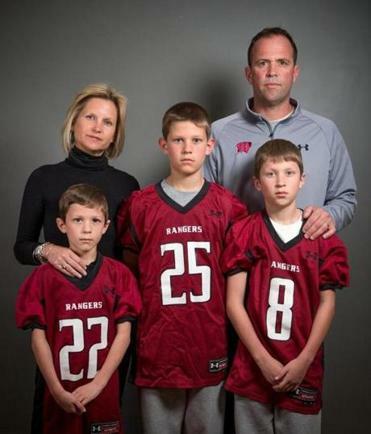 The Good family boys – Jackie, 8, Zack, 12, and Luke, 10 – all play football for the Westborough Rangers, coached by dad Jack and cheered by mom Dede. IN WESTBOROUGH, youth football is bucking the trend seen in the town’s high school and elsewhere: Participation has jumped from 110 players to more than 130 over the last three years. That’s largely because a new group of coaches has taken over the program, which goes up to eighth grade. They’ve increased recruiting efforts, purchased new equipment, and shifted away from Pop Warner, in which teams are based on weight and ages, to American Youth Football, which has grade-based teams and no weight limits. League president Jack Good, whose three sons played last season, routinely fields questions from parents worried about concussions. He responds by outlining the prevention program, which includes coach training and free base-line testing. He emphasizes that concussions happen in every sport and arranges for concerned parents to talk with parents of current players, to hear how they deal with the risks. “We’ve been pretty successful” in allaying fears, Good says, estimating that half of parents who ask about concussions ultimately let their children play. In general, a child who suffers a concussion will get much better medical care than he did even a decade ago. As recently as 2006, Boston Children’s Hospital had limited expertise in dealing with sports concussions. Today, Dr. William Meehan, who leads the hospital’s Sports Concussion Clinic and wrote Kids, Sports, and Concussion, directs the Micheli Center for Sports Injury Prevention in Waltham, which offers concussion prevention programs. Meehan, who lettered in four sports in high school, doesn’t believe the risk of concussion should deter children from playing sports, even football. He believes parents are conflating the risks of concussion with the risks of CTE, which is mostly afflicting former NFL players. “Given the number of athletes who’ve played Pop Warner and high school football, I’d be really surprised if there is this increased risk [of CTE] and we haven’t seen it,” Meehan says. “We’re talking hundreds of thousands or even millions of former players who would be suffering from this. I hate to see people stop playing sports for something that is very, very low risk — if there’s any extra risk at all.” Meehan, who became a father this winter, says his son will be allowed to play any sport he wants — except the combat sports mixed martial arts and boxing. Some former football players believe there’s little harm in making kids wait. Peter Casparriello played tight end on the Boston College football team during the Doug Flutie era. (He was one of the receivers on the 1984 Hail Mary play against Miami.) Casparriello has three sons who’ve played football, and none started before sixth grade. “Football is not one of those sports where you need to start when you’re 4 years old,” he says. John Ragan, another former Boston College player, also weighed when his two sons, Sean and Matthew, should suit up. Sean, who’s now 16, began playing in seventh grade, and by last season, as a 6-foot-4, 270-pound sophomore offensive lineman at St. John’s in Shrewsbury, he started in a state championship game at Gillette Stadium. (Sean hopes to play in college.) Today John is on the board of directors of Westborough’s youth football program, where he takes occasional ribbing for not allowing his younger son Matthew, 11, to play for another year or two. “Most people respect our decision — every family is different, and everyone has to make their own decision,” Ragan says. 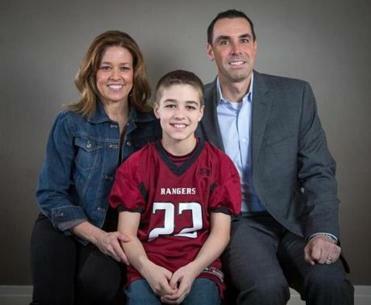 Luke Lentine, 12, has suffered two concussions (one in football, one in soccer). His doctors have told parents Cheryl and John that he can keep playing. SO WHAT WILL MY FAMILY decide about football? I wish I had an easy answer. At a minimum, my conversations with medical professionals have convinced me that all three of my children — including my daughter, 15, who skis and competes in horseback riding — should receive base-line cognitive tests. Our high school offers these tests to its student-athletes, but since my boys aren’t yet in high school and my daughter doesn’t participate in a high school sport, I plan to have the tests done privately. (The Micheli Center in Waltham offers them for $25.) This way if one of them does suffer a concussion, doctors will have better information to help manage the recovery. After reading Meehan’s book and interviewing experts, I’d be comfortable with my boys playing football — particularly at Westborough High, where the athletic trainer seems empowered to prioritize safety. Even for Jack, who’s already suffered one serious concussion (and had two subsequent minor ones), I believe the long-term effect of another one wouldn’t be life-altering. My stance on this reflects my personality: I am easily swayed by statistics and experts, and I’m generally an optimist. If tomorrow’s forecast is 70 percent sunny, I tend to dismiss the chance of rain. She asks another hard-to-answer question: We understand the potential downsides of playing football, but what, precisely, is the upside? If our sons don’t play football, they’ll probably keep busy in the fall playing on year-round baseball and basketball teams. Against that backdrop, why is football such a missed opportunity? One answer comes from Westborough High School athletic trainer Sarah Carver. She’s never played a down of football, but she has spent the last decade roaming the sidelines of just about every high school and college sport. That’s given her a special appreciation for football. “The courage it takes and the literal difficulty of the things you have to do — it’s like no other sport,” she says. While every team enjoys camaraderie, she believes the physical demands and ways in which football requires players to protect teammates from harm builds deeper bonds. “It’s such a great sport . . . but to try to explain it to a wife or a mother is going to be difficult,” Carver says. Which is why, in our driveway, we have a very nice basketball hoop, and for the time being, I’m encouraging our sons to focus their energies on it. Daniel McGinn is a senior editor at Harvard Business Review. Send comments to magazine@globe.com.